So you have decided it is time to make a change. 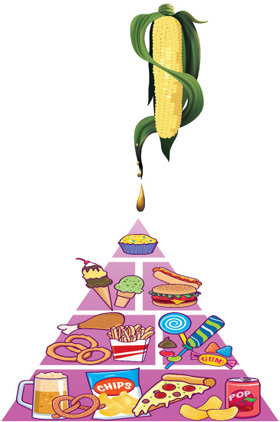 The media storm of anti-High Fructose Corn Syrup publicity (lots being scientifically-based, but admittedly, some propaganda-based as well) has inspired you to eliminate foods with HFCS from your diet. Now you are searching for advice on how to execute on your inspiration. Congratulations, you’ve found the right blog. Before we start digging deep, we MUST all acknowledge an inconvenient truth – simply replacing High Fructose Corn Syrup with table sugar is not the answer. While it is true that HFCS has some uniquely unenviable biological consequences (which I chronicle in detail here), consumption of ‘added sugar’ in general presents NO health benefits (understand what is considered an ‘added sugar’). The average American consumes 22 tablespoons (355 calories) of added sugar daily, whereas the American Heart Association’s recommended consumption is no more than 6 and 9 tablespoons for women and men, respectively. Clearly the issue is general over-consumption of sugar, with High Fructose Corn Syrup being the secondary concern. With that said, in addition to limiting our daily injection of these not so innocuous drugs we call sugars, specifically eliminating HFCS from our diet is a great idea. Lets discuss how! 1. Raid your kitchen & identify foods with HFCS. HFCS can be found in most processed foods, so this may be a time-consuming ordeal. Start with the freezer. Any dessert (ice-cream, cookie dough, pie etc.) is likely to have it added. Then move to the fridge. Sugar-sweetened beverages are the largest dietary source HFCS, so most processed beverages (soda, fruit juice from concentrate) will contain the stuff. These are the easy targets. Unfortunately, many grain-based products in the pantry also contain HFCS, and so do some beloved condiments like ketchup. 2. Make the tough choices: which foods with HFCS can you live without, and which can’t you? So you’ve identified your kitchen’s culprits. At this point, it is time to step back and remember why you are going through this process. Are you relatively healthy, but trying to improve for your long-term health and for the sake of your kids? Or are you overweight, and trying to slim down? If the answer is closer to the latter, then you need to decide which foods you should be cutting out all together. Desserts and sodas, even if they contain cane sugar or an artificial sweetener, are not going to help your fight. Do your best to make the right choice! 3. Make the necessary replacements. Once you’ve made the tough decisions, it’s time to hit the grocery store and find HFCS-free substitutes. For the record, this goal can be achieved without hitting up an over-priced Whole Foods. Most large-scale grocery stores now contain HFCS-free alternatives for almost all foods. To make this easier, I encourage you to check out this awesome list of HFCS-free foods: List of Products with no High Fructose Corn Syrup. 4. Beware of eating out! For most of us, reality mandates that we eat out on occasion. Furthermore, not all of us live in organic-crazed cities like San Francisco & Portland, so finding HFCS-free foods can be a challenge. In facing this challenge, the best advice I can give is to use logic and ask questions. If this fails, just remember that the occasional encounter with HFCS isn’t going to kill you! I’d be interested to hear which grocery stores have HFCS alternatives for “almost all foods.” I have yet to find one that even comes close. Whole Foods is not overpriced. Most of the items WF carries that are also available at the the GMO/HFCS Poison Palaces (aka, traditional grocery stores) are about the same price, and often cheaper at WF. You do pay a premium for many items at WF because they are BETTER QUALITY PRODUCTS. It costs more to raise beef in a humane, healthier way. It costs more to pasture raise chickens. It costs more to raise organic crops. It also costs more to provide your employees with good wages and benefits. It is a royal pain in the rear to try to shop for real food at typical grocery stores. You have to literally read the label on every single item you put in the cart. It takes forever, and any cost savings you might see (which I contend you don’t) is eaten up in wasted time anyway. You also have to read through the marketing hype meant to trick people into believing an item is “all natural” or “healthy.” At WF I know that none of their products contains HFCS, most are GMO-free, and the only labels I need to see are things like “local” or “organic,” and those are the norm, not the exception. I get that you are trying to tell people that shopping responsibly can be (somewhat) accomplished at traditional grocery stores, but do not demonize or make false claims about a business that has been at the forefront of improving the way we eat, raising awareness about the horrific corporate farming industry, and improving the practices of the food supply chain. Thanks for your feedback JB. Not sure if you have them in your area, but here in Cleveland Ohio, we got a recent and very welcome addition in the form of a store called Earth Fare that vows it does not and never will carry any HFCS EVER. It is more expensive, granted, but all that label reading is forgotten – although I do still check here and there I suppose “to be sure”, but yeah, it’s a great store! Read the ingredients labels. I find foods without it all the time and in regular and discount grocery stores. I agree that stores like Whole Foods and Trader Joe’s have been leaders in not supporting BAD ingredients and raising awareness about these foods. It’s not that Whole Foods is overpriced. The question in my mind is, why do whole and healthy foods cost so much more and become inaccessible for many people. Why does a gallon of organic milk cost $7 while the normal stuff costs closer to $2. I only buy the organic dairy products but I am not certain everyone woul know or be in a position to make that choice. As a health coach, Ipromote drinking water, instead of milk and juices. Humans were meant to drink water, which is always the less costly option. As a health coach, I promote drinking water, instead of milk and juices. Humans were meant to drink water, which is always the less costly option. We started to buy fully Organic when I was pregnant with my first child. While ketchup and mustard in the Organic variety are the same price as the HFCS ones there are a many things that are just a little more pricy. BUT if you shop around you’ll find that eating organic doesnt really cost more. We havent been sick or had to go to the doctor or get meds in over 4 years – I guess that’s a cost savings right there! MILK is least expensive at Meijers. A gallon of Organic is $5.49 here in Michigan. Trader Joes is $5.69 and Kroger is $6.89. I haven’t been to WF in a while. Check out Meijers if you have one, They have a HUGE line of Organic Products, fruits/veggies, bread, condiments, baking products etc. and at lower costs. It seems simple to me, just cook from scratch. That’s what I do, and therefore I know what I’m eating and it’s very rare that it includes HFCS. HFCS is generally in processed food, along with all manner of other ingredients that are simply bad for you. Once you cut out processed food, you cut out HFCS. Simple. The presence of cheap sugar makes unpalatable foods with no nutrition whatsoever, tasty and addictive. Foods processed more than 2 times through a grinder or mill, are essentially stripped of ALL vitamins and minerals and need Sugar and artificial vitamins with unpronounceable names to pass the WEAK FDA requirements for “food”. When a labels are filled with these iunpronounceable names, stay the heck away!! Or you literally starve to death while being labeled obese! I check the labels of everything I buy to try and avoid corn syrup. If I can’t find a brand without HFCS then I find a way to make it at home, for instance whip cream topping I started making and it is actually very easy. Same with marinades and other things. I check the labels even at Whole Foods. I have found that HFCS is in some of their items. I was disappointed to find this. Checking labels is a way of life if we want to avoid added chemicals. It may have started when breakfast cereals went from being a health food to a presweetened kiddie trap. Food manufacturers quickly found that adding a little sugar to nearly anything gave them an advantage over unadulterated products and in the process created an entire nation of sugar addicts. Sweetened hoagie rolls are an abomination. Sweetened peanut butter is a crime against children. Remember that quality is inversely proportional to the number of ingredients. I shop at a regular grocery store and superstore everyday. I live in a small town and we do not have much to chose from and we certainly do not have any fancy health food stores. My family eats extremely healthy very very limited processed foods, no white flour etc. I have found once you become familiar with the process of buying “clean” foods it becomes easier and easier. You get to know the limited brands you can buy. Generally if you stay away from processed foods you do not have to worry so much about hfcs. Usually I do not buy anything that is seasoned I spend the extra time and do it myself with veggies, herbs, spices and natural sweeteners. I am also extremely frugal and if you spend a little time you can buy most fresh foods for a reasonable price you just have to be willing to be a little flexible. Buy and stock up when they are on sale.